Label material, adhesive and construction need to be designed to meet your application requirements. BCA facilitates the above by working with major suppliers of blank and pre-printed labels that specialize in Hospital and Laboratory Applications. Your present labels work fine, but here are 2 unique labels I want to bring to your attention. There are pictures on the next pages. 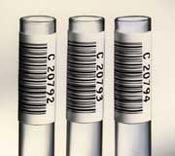 The OnSlide program from Computype will produce a 2-piece label set on demand for your slide or sample identification. The OnSlide Labeling System includes ribbon and label stock, software and printer. 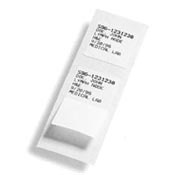 The Flaplabel consists of a slide label with an overlay protecting your data and a standard label to be used on work sheets. The FLAPlabel is resistant to chemicals like xylene, ethanol, acetone, methanol and staining, making it possible to apply it on slides prior to processing and staining. These labels are midway in diameter between the standard circle labels shown in catalogues. They fit the top of your tubes using glove free adhesive. Because of the unique printing requirements, we usually pre-print the labels for you. All you do is supply the number sequence. Please view the label samples on the next page.